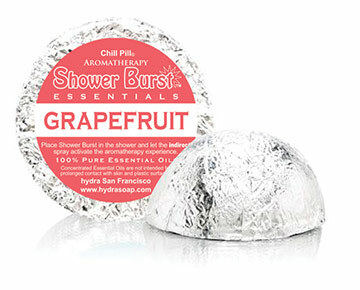 For the purist, this Shower Burst is made with 100% Grapefruit essential oil. Aromatherapy is a practice that has been around for more than 6000 years. It uses volatile plant oils, including essential oils, for psychological and physical well-being. Essential oils, the pure essence of a plant, have been found to provide these benefits when used correctly, safely and consistently. Hydra only uses the word aromatherapy when using 100% essential oils.